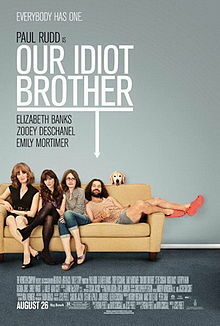 “Our Idiot Brother” isn’t too concerned with having a concrete plot, but the film’s events are set in motion when Ned, a friendly pot dealer, is sent to jail after he naively sells dope to a police officer. Released from prison eight months later, Ned’s girlfriend dumps him, kicks him out of their home, and refuses to let Ned take his dog. With nowhere else to go, Ned turns to his family and is shuffled between his three sisters – Miranda (Elizabeth Banks), Natalie (Zooey Deschanel), and Liz (Emily Mortimer) – while performing odd jobs for them and others to make money. That’s about it in terms of story; the film’s first act is certainly the roughest, as the film meanders aimlessly from scene to scene, playing more like a loose series of vignettes that could be rearranged in any order rather than an actual narrative. It’s pleasant enough, but the film really becomes enjoyable once the script starts focusing on how Ned’s positive and honest demeanor makes those around him confront their own flaws and lies. Most of the characters in the film are extremely likable, but as with all humans, they aren’t perfect, and the film finds its creative footing by allowing Ned’s presence to blow everyone’s lives wide open, for better and for worse. I don’t know if the script is ever truly consistent, but the chain of events moves organically and there’s a real charm in juxtaposing Ned’s infallible love of life against a group of people who have a much harder time embracing their circumstances, and it even leads to a few darker moments that add a good sense of weight to the proceedings. But on its own, this story and this script really isn’t anything special. It’s the cast that makes the film work, led by the wonderful Paul Rudd. As a character, Ned is a combination of all the things Rudd does best; he’s likable, funny, loving, and undoubtedly human, and Rudd’s enthusiasm for the character is apparent in every single scene, proving why he is one of cinema’s most beloved comic talents. Zooey Deschanel’s presence as sister Natalie is equally welcome; like Rudd, she is adorable and engaging no matter what the role, and though her character is far more flawed than Ned (arguably making her more interesting), Deschanel maintains the same amount of humanity as Rudd, and earns just as many laughs with less screentime. If these two ever headlined a romantic comedy together, it would almost certainly be titled “Amiable,” and the film would end within five minutes of the characters meeting because no semblance of tension could possibly be maintained between two performers this adorable. As for Ned’s other sisters, Elizabeth Banks, who also specializes in affability, shines brightly as Miranda, a Vanity Fair reporter whose desire to publish a hit story compromises her journalistic ethics. I didn’t so much enjoy Emily Mortimer as Liz, but that’s really no fault of Mortimer’s; the character simply has no arc and no personality. It’s not a deal-breaker, though, as we also get a host of great comedians outside the family: Rashida Jones starts out playing her normal straight-woman persona as Natalie’s girlfriend, but gradually modulates to being hilarious in her own right. Adam Scott, so funny on Parks and Recreation, gets plenty of laughs out of his dead-pan, down-to-earth style in a limited amount of screen-time. Finally, stand-up comedian T.J. Miller threatens to steal the entire show in his few appearances as Billy, another pot dealer who becomes Ned’s friend despite dating Ned’s ex. The thing all of these characters and performers have in common is that while they have their flaws, they are charming and engaging at all times (which is why the one character who absolutely doesn’t work, Liz’s philandering husband played by Steve Coogan, is the only one without redeemable qualities), and there’s an endearing humanity that shines through the entire ensemble. On page, I’m not sure if “Our Idiot Brother” is anything special, and Jesse Peretz’ direction slides from ‘competent’ to ‘distractingly amateurish’ a few too many times, but spending 90 minutes with this cast is so much fun that I can’t resist giving the film a hearty recommendation. At the very least, watching Rudd and Deschanel share the screen should fill one’s ‘adorable’ quotient for the next several months.